Hard ferrites are performed as barium ferrite (BaFe) and strontium ferrite (SrFe). 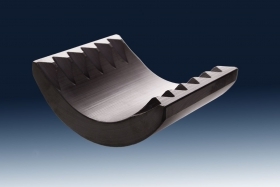 Hard ferrites are low-cost magnets with good magnetic properties. Hard ferrite has a similar hardness and brittleness to ceramic materials, so it is workable only with a diamond tool. As is typical of oxide ceramics, hard ferrite magnets display relatively resistant behavior towards moisture, solvents, alkaline solutions, weak acids, salts, lubricants and gas pollutants.